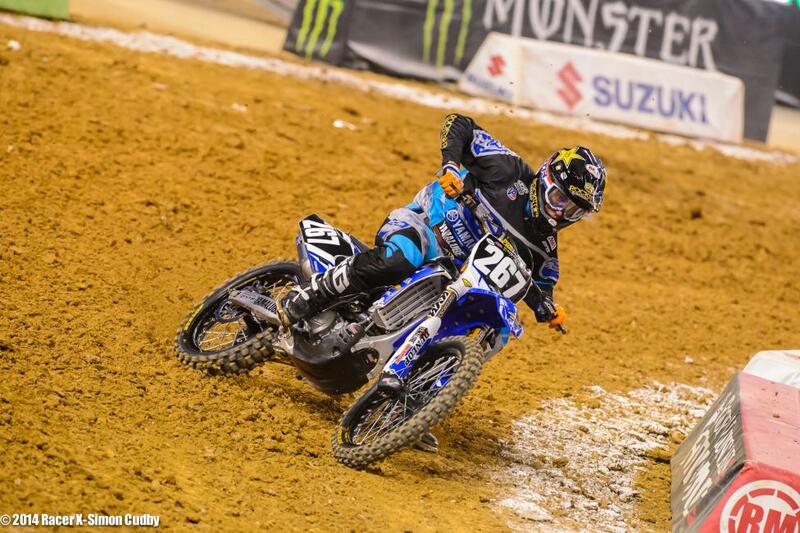 This weekend marked the attempted return of Chad Reed after his devastating crash in San Diego last weekend as well as the emergence of a handful of supercross rookies for the opening round of the 250SX East series. Reed didn’t fare too well with his injury early on in practice and had to call it a day, but his seasoned rival stepped up once again to take another win this season. 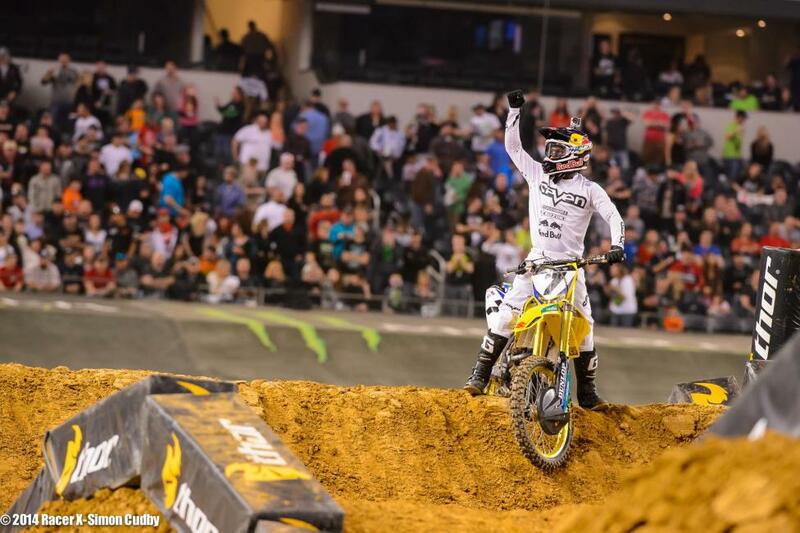 Yoshimura Suzuki’s James Stewart captured the first set of back-to-back wins seen in the 2014 450SX series here in Arlington. Though Stewart ranks in at third on the all-time supercross win list, the other winner from tonight’s races is only getting started. 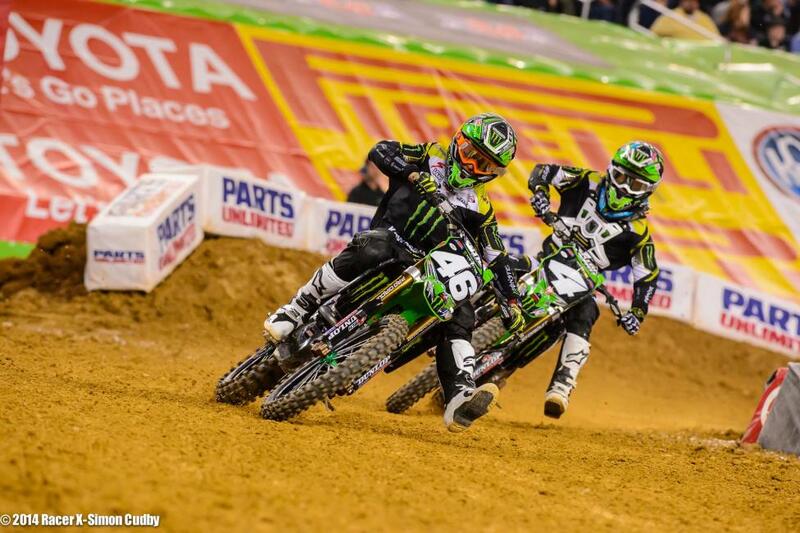 Monster Energy/Pro Circuit Kawasaki’s Adam Cianciarulo captured the 250SX East opener win in his debut supercross appearance—but first, let’s take a look at the 450SX main event. Red Bull KTM’s Ryan Dungey led the pack around the first corner with James Stewart on his rear wheel and just to the inside. 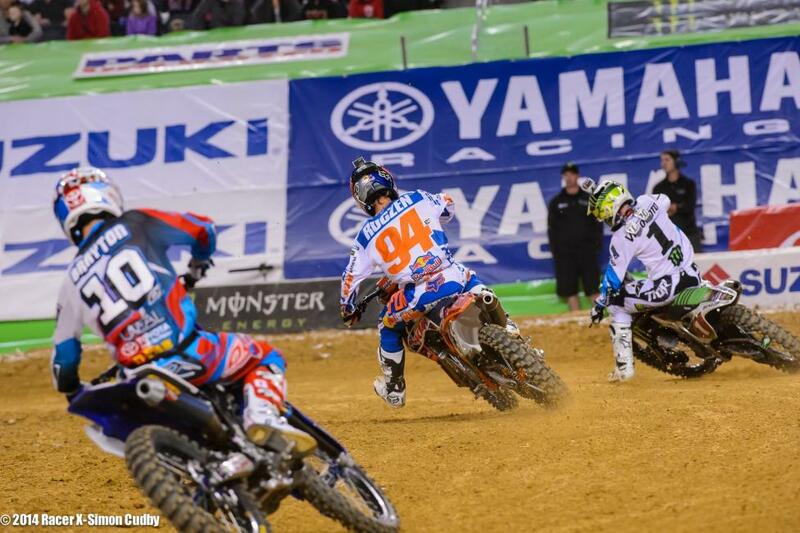 Justin Barcia followed the duo up in third, with Justin Brayton, Ken Roczen and Ryan Villopoto close behind. 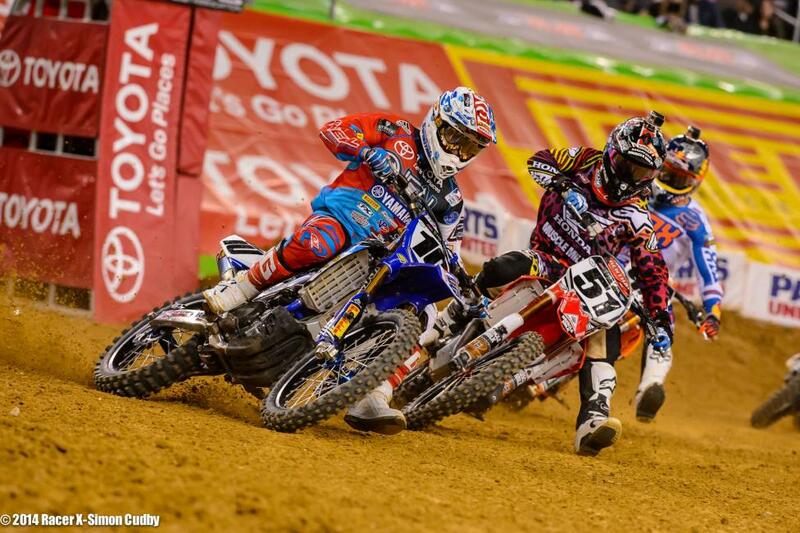 Barcia was unable to triple onto the tabletop before one of the two standard supercross triples, which allowed Brayton to move into third. Stewart stayed on Dungey during the opening laps and found an open door through the finish-line corner going into lap three. Stewart made the pass for the lead and never looked back. 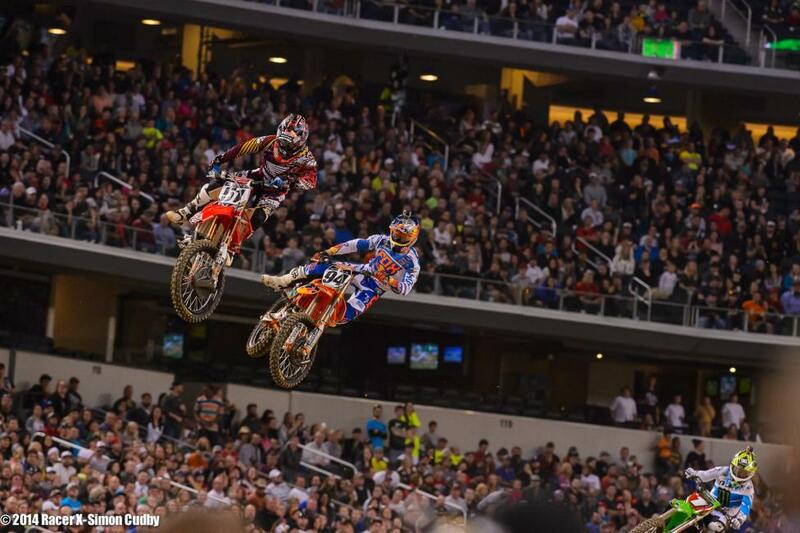 Roczen made a block pass on Barcia, but Barcia answered back in the next corner. The two looked to be dangerously close as they launched over the ensuing triple. 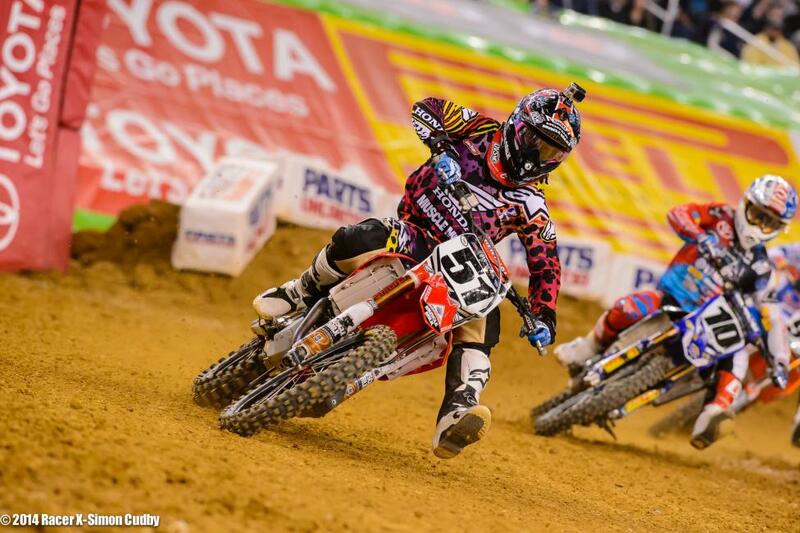 Barcia held the position over Roczen and eventually moved up and passed Brayton. The top six riders had separated themselves from the rest of the pack at this point. 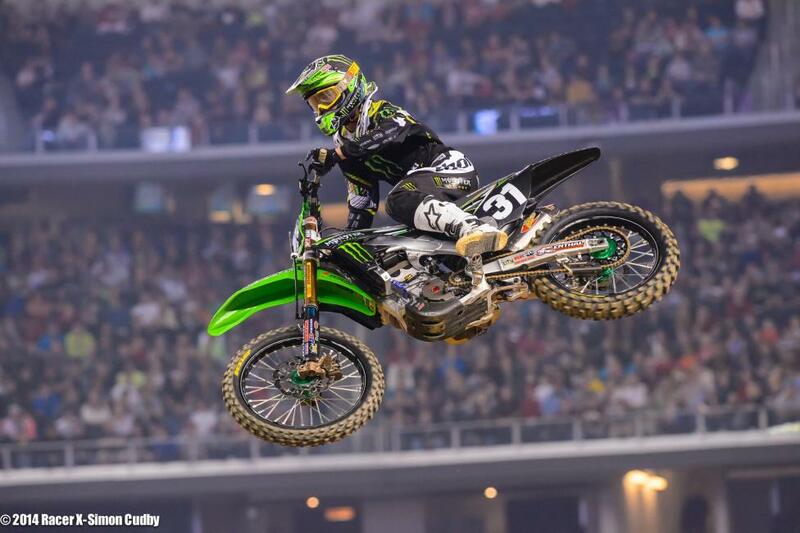 Villopoto sat back in sixth for half the race before he was able to make a move on Roczen for fifth. Though Brayton certainly wasn’t the only rider making mistakes in that lead group of six, his error cost him two spots right away, as Villopoto and Roczen were right there to capitalize. However, Brayton was able to regain a position from Roczen after the Red Bull KTM rider bobbled in a bowl turn upon casing the last triple in a rhythm section. Stewart rode a comfortable race to the win, leading 18 out of the 20 laps. Dungey rode relatively unchallenged for the remainder of the race as well, and Barcia was able to emerge out of the pack for his first podium appearance of the season. 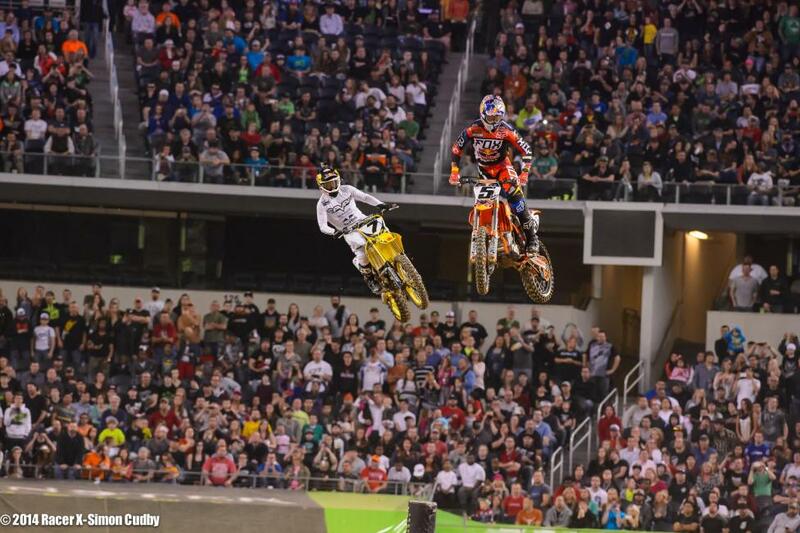 It wasn’t AC from start to finish in the 250SX main event, but it was pretty close. 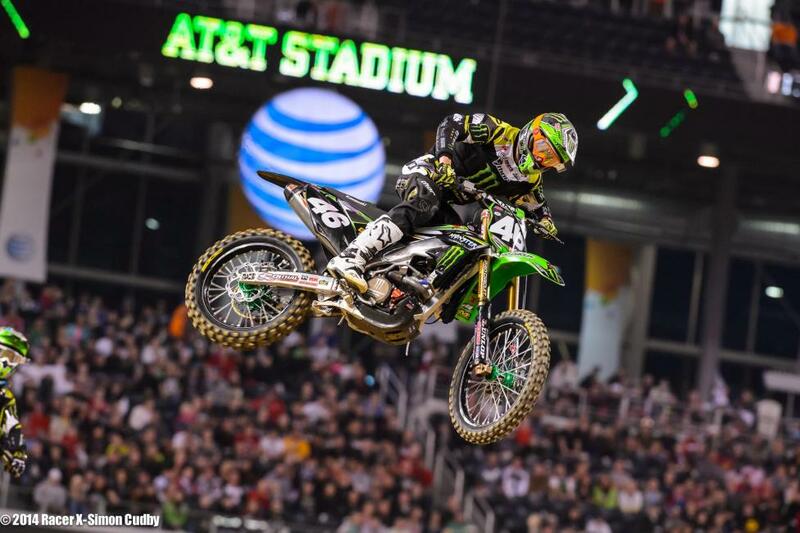 Cianciarulo edged out teammate Martin Davalos for the holeshot in his first-ever 250SX main event. 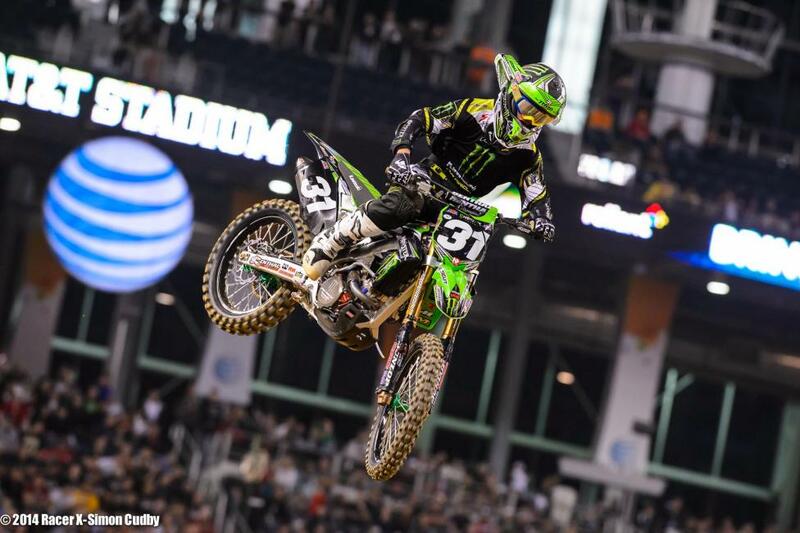 However, Davalos was able to make it to the following corner before Cianciarulo to take the lead. Davalos led the opening laps before high siding in the same corner just a few laps later. 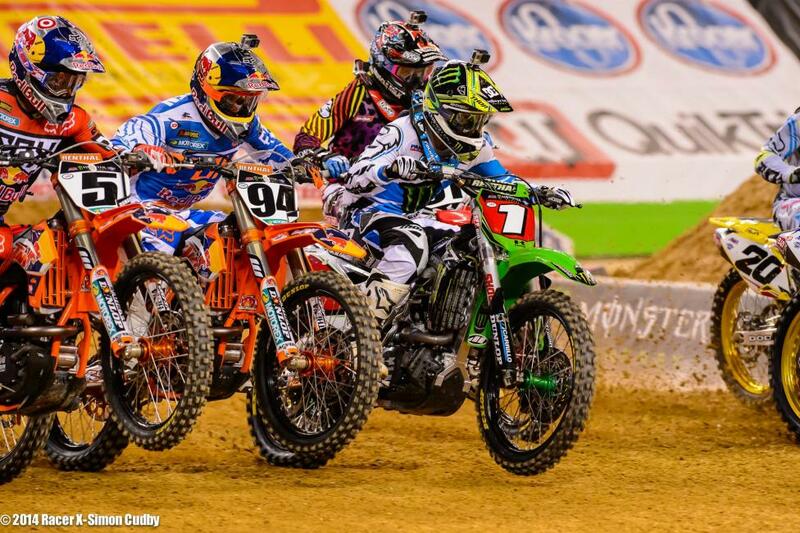 Cianciarulo inherited the lead, but had his other teammate, Blake Baggett, right behind him. Fellow supercross rookie Anthony Rodriguez followed up the duo in third place before crashing in the same corner as Davalos. 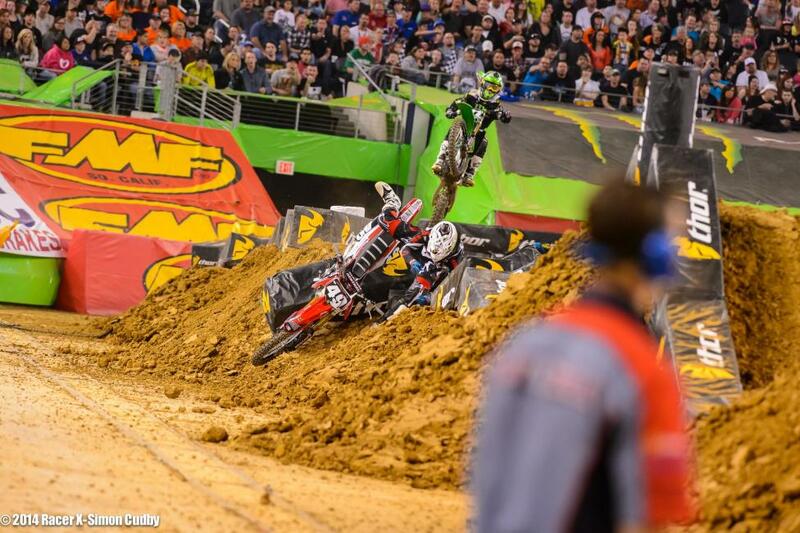 Rodriguez’s crash was severe enough to pack it in for the night. Gavin Faith was able to hold down third for some time, but he too would crash out of the race. 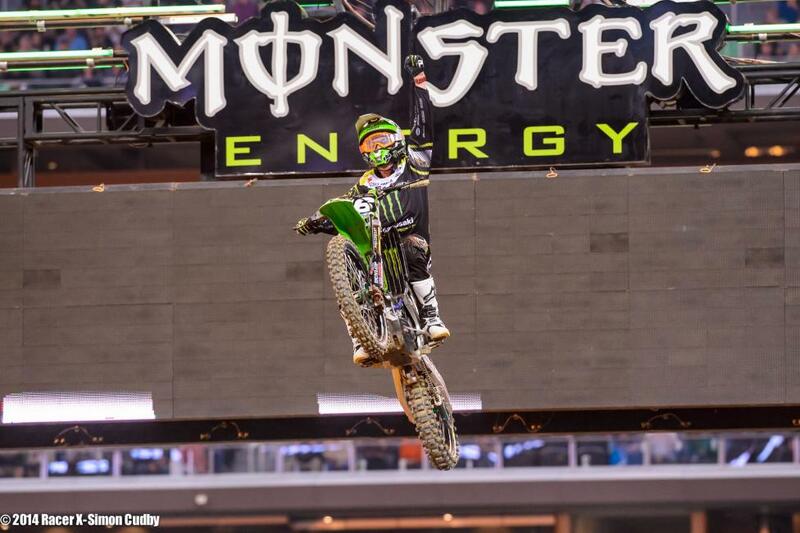 Davalos came back after two crashes and a broken helmet visor to climb back up to third. 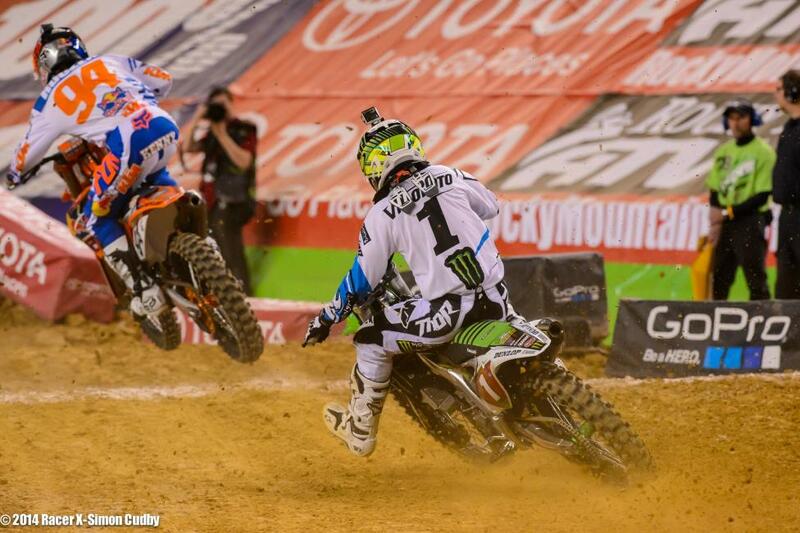 Cianciarulo and Baggett diced it out for a lap before Cianciarulo took the lead once and for all. 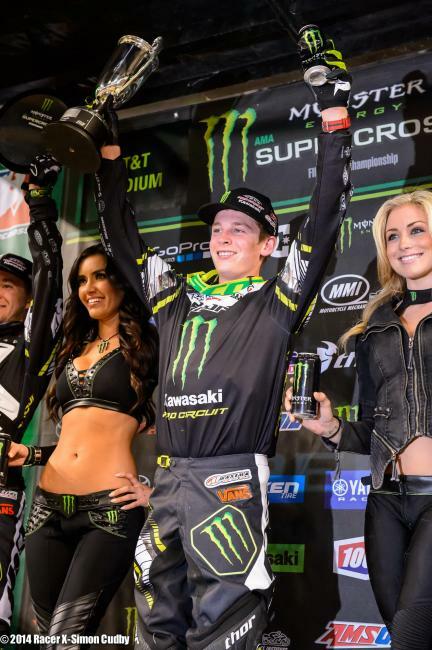 After a less-than-stellar Pro Motocross debut, Cianciarulo cleaned his professional racing slate by seizing the win in his debut supercross race. Baggett followed up his teammate for a second-place finish, as did Davalos for an all-Monster Energy/Pro Circuit Kawasaki podium.